Play for a Cure, with Brisbane Panthers Softball club, held a Pink Panther Day on the 15th October. It was held at the headquarters for Brisbane Softball, Downey Park! This event was held last year and again the Panthers Club got into the spirit by wearing their pink socks to raise awareness of breast cancer. 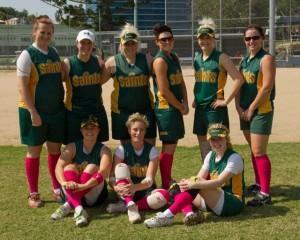 Saints softball club A1 also participated, looking sharp in their hot pink socks – thank you ladies! Downey Park, softball and fundraiser = rain! Saturday was no different. An all day BBQ was planned, however junior fixtures were washed out, effectively wiping out the morning BBQ. So we relied on the afternoon being a hit, and all was going great guns until, you guessed it, the rains came through again – and not just light rain! We packed up early, but not before raising over $200 – due mainly to hamburger sales and the campaigning of Taylor Dunn. 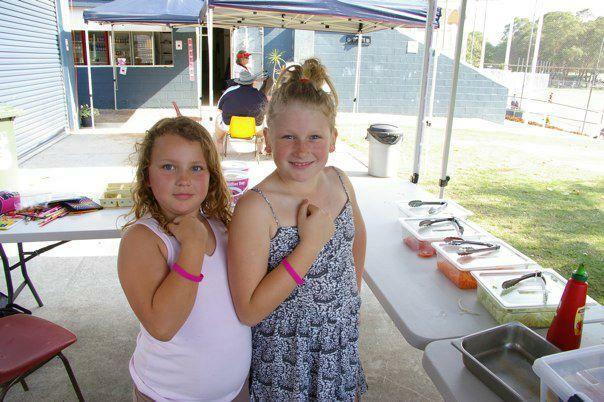 Taylor, only 7, stayed with Leigh all day taking the money for burgers, selling cupcakes and pink P4AC wristbands. Her older sister, Bron joined her later and they walked around the park asking for donations. Thank you girls, especially Taylor, you were an amazing help! October is Breast Cancer awareness month – donations will be accepted all month at this link. Please help us make a difference. All donations $2 and over are Tax deductible. To check out the photos from the day, click here. This entry was posted on Monday, October 17th, 2011 at 10:30 am and is filed under 2011, Previous Events. You can follow any responses to this entry through the RSS 2.0 feed. You can leave a response, or trackback from your own site.